Your browser does not support inline frames or is currently configured not to display inline frames. Please come into the 20'th century, lazy a**. I feel impelled to write a few lines that may fall under your eye when I am no more . . . I have no misgivings about, or lack of confidence in the cause in which I am engaged, and my courage does not halt or falter. I know how American Civilization now leans upon the triumph of the Government and how great a debt we owe to those who went before us through the blood and sufferings of the Revolution and I am willing—perfectly willing—to lay down all my joys in this life, to help maintain this Government, and to pay that debt. Sarah, my love for you is deathless, it seems to bind me with mighty cables that nothing but omnipotence could break; and yet my love of Country comes over me like a strong wind and bears me irresistibly with all those chains to the battle field. The memory of all the blissful moments I have enjoyed with you come crowding over me, and I feel most deeply grateful to God and you that I have enjoyed them for so long, and how hard it is for me to give them up and burn to ashes the hopes of future years, when, God willing, we might still have lived and loved together and see our boys grow up to honorable manhood, around us. If I do not return my dear Sarah, never forget how much I loved you, nor that when that my last breath escapes me on the battle field, it will whisper your name. Forgive my many faults and the many pains I have caused you. How thoughtless, how foolish I have sometimes been. But, O Sarah! If the dead can come back to this earth and flit unseen around those they loved, I shall always be with you; in the brightest days and the darkest night . . . always, always, and when the soft breeze fans your cheek, it shall be my breath, or the cool air, your throbbing temple, it shall be my spirit passing by. Sarah, do not mourn me dead; think I am gone and wait for me, for we shall meet again . 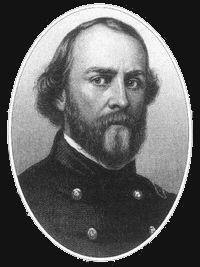 . .
Sullivan Ballou was killed a week later at the first Battle of Bull Run, July 21, 1861. Born March 28, 1829 in Smithfield, R.I., Ballou was educated at Phillips Academy in Andover, Mass. ; Brown University in Providence, R.I. and the National Law School in Ballston, N.Y. He was admitted to the Rhode Island Bar in 1853. Ballou devoted his brief life to public service. He was elected in 1854 as clerk of the Rhode Island House of Representatives, later serving as its speaker. He married Sarah Hart Shumway on October 15, 1855, and the following year saw the birth of their first child, Edgar. A second son, William, was born in 1859. Ballou immediately entered the military in 1861 after the war broke out. He became judge advocate of the Rhode Island militia and was 32 at the time of his death at the first Battle of Bull Run on July 21, 1861. When he died, his wife was 24. She later moved to New Jersey to live out her life with her son, William, and never re-married. She died at age 80 in 1917. Sullivan and Sarah Ballou are buried next to each other at Swan Point Cemetery in Providence, RI. There are no known living descendants. 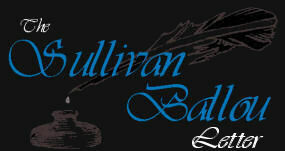 Ironically, Sullivan Ballou’s letter was never mailed. Although Sarah would receive other, decidedly more upbeat letters, dated after the now-famous letter from the battlefield, the letter in question would be found among Sullivan Ballou’s effects when Gov. William Sprague of Rhode Island traveled to Virginia to retrieve the remains of his state’s sons who had fallen in battle. Additionally: This web site is a virtual window to the life of Eric Kinkel, it reveals: non threatening, harmless personal content, images and editorial commentary often humorous in nature and never meant to cause harm to any corporation, LLC, group of persons, race, ethnicity or, any one individual. This site is specifically created and designed to continually inform, update and occasionally be entertaining for those who have interest in the many projects initiated. Names of those who have worked with Mr. Kinkel on projects, personal, professional or otherwise, may appear on this website.